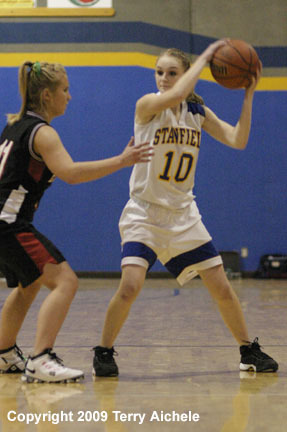 STANFIELD - The 5-0 Enterprise Outlaws had their hands full but were able to defeat the Stanfield Lady Tigers on Saturday, January 16, 2009 by a score of 55-48. At the end of the third period Enterprise was holding on to a two point lead 37-35. The scrappy Tigers were making it a real competitive game. The Tigers were able to close in to within three points several times in the fourth period. Strong play by Jessenia Carrillo, Mikayla Baros, and Erica Gehrke gave the Tiger fans hope that they might see a win. Unfortunately the Tigers scoring went dry with two minutes to go in the game. The Tigers started to intentionally foul Outlaw players over the last minute and a half of play in a last ditch chance to close the gap. The Enterprise players hit some of their freethrows and Stanfield couldn't get their shots to go down. Enterprise won 55-48. 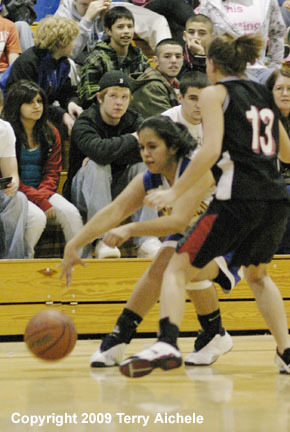 LEFT - Enterprise defenders try to distract Jessenia Carrillo of Stanfield. 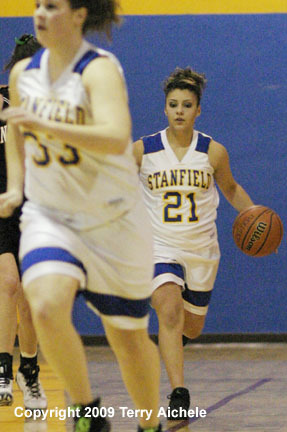 RIGHT - Jade Martinez of Stanfield follows teammate Tara Nichols during the second half of Saturday's game. 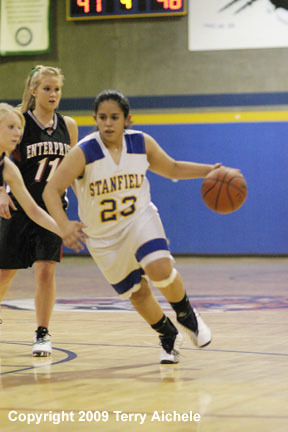 LEFT - Jessinia Carrillo of Stanfield moves along the key. RIGHT - Erica Gehrke of the Tigers looks for a teammate to pass to. LEFT - Jessenia Carrillo tries to maker her away around Kayla Foster of the Outlaws. 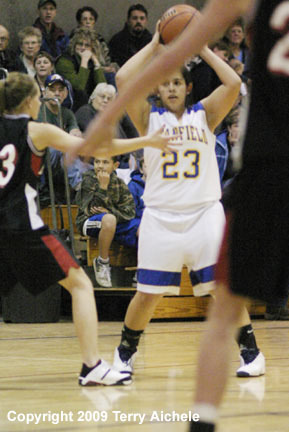 RIGHT - Jessenia Carrillo of Stanfield prepares to throw an inbound pass. 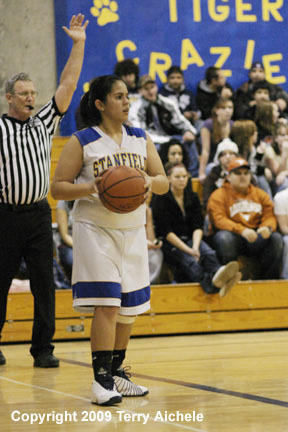 LEFT - Jessenia Carrillo of Stanfield looks for an open teammate. 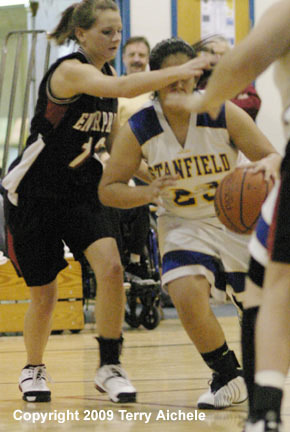 RIGHT - Erica Gehrke of Stanfield comes face to face with Outlaw Sarah Butterfield.